Mario has all the glory when it comes to Nintendo. His brother Luigi had one other attempt at his own game but that was terrible (Mario is Missing on Super Nintendo). Nintendo pulled this game out of their pocket and what they came up with is a ghostbuster type game. Luigi's has to save Mario for once. There is no princess but one new character, Professor E. Gadd. It all starts when Luigi receives a strange letter from Mario saying he won a mansion in a contest, even though he never entered any contest to begin with. Then the game starts where your inside the mansion with no clue what is going on, or what to expect. Then enters Professor E. Gadd, the small bald genius who explains everything to you. I am not going to give away any more. I recommend buying this game, a Players Choice, which usually go for $19.99 or less for used. 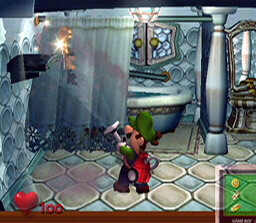 It is a good game for any Mario and Luigi fan. 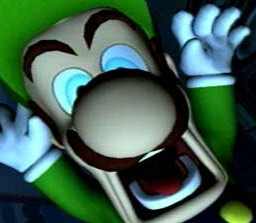 Controlling Luigi's and his Poltergeist 3000 (vacuum cleaner) can be tedious at first. Once you have the controls figured out your golden. The game is made for mainly Nintendo's younger crowd, it can be fun for anyone though. Sadly, it only takes 6-8 hours to beat, that's also with getting all the hidden secrets. The Lighting is real nice, Nintendo takes full advantage of their hardware with mirror reflections and lighting effects. Then the main enemies of the game are mostly transparent, sometimes to find them you have to find their shadows or shine them with your flashlight. 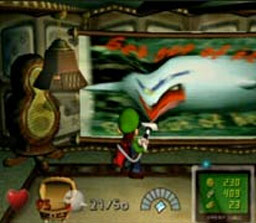 Its interesting to play a Ghoul game with Luigi as the main character, with great graphics. What do you think of this game? 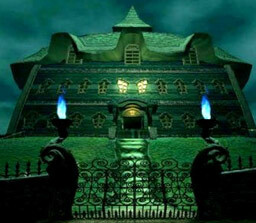 Click here to discuss Luigi's Mansion in our forum.